The effectiveness of agile processes is often jeopardized because the architecture and organizational pre-requisites of agility are neglected. 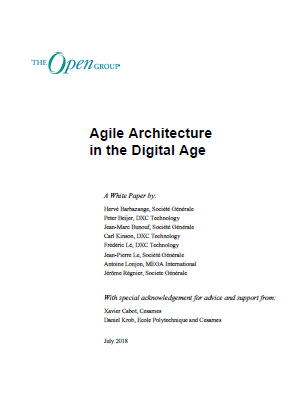 This White Paper proposes a new architecture framework, the Agile Architecture Framework (AAF), that meets the needs of the digital enterprise. This proposed architecture approach will enable organizations at all scales to better realize the Boundaryless Information Flow™ vision achieved through global interoperability in a secure, reliable, and timely manner.